Language has historically been a written and audio tool to distinguish social classes. Authors and playwrights – think Dickens, Shakespeare and Moliere – used malapropisms in dialogue when those from a lower class wished to appear educated while speaking to a higher-up. Their attempts to use proper words and grammar often resulted in a mangled phrase or two. Rubin states that historically malapropisms substituted words that made no sense in the context they were used. The correct word ‘pinnacle‘ has no correlation to the malapropism ‘pineapple‘. As social class barriers disappear and social media proliferates, a different kind of malapropism has been identified by descriptive linguists (those who study how language IS used, rather than how it SHOULD BE used). The term ‘eggcorn’ was chosen when someone mistakenly used it instead of ‘acorn‘. ‘Eggcorn‘ is now recognized as a term for a distinct kind of malapropism. Unlike the above ‘pineapple’ example, descriptive linguists think there is a correlation between ‘eggcorn’ and acorn‘ – that someone hearing the mumbled word ‘acorn‘, while examining one for the first time, could mistakenly hear ‘eggcorn‘ and think it is the correct word because of an acorn’s slightly egg-shaped look and its resemblance to a corn kernel. This is noted as one distinction between the type of malapropism occurring because of social class interaction and those coming from inadvertent misunderstandings. Descriptive linguists also make a distinction between malapropisms that originated during historical times when proper English was the ultimate standard and our modern era when the pace and style of communication have significantly relaxed the language we use to communicate. Our constant chatter in Tweets, Snapchats, talk radio, reality shows and celebrity-centric rag magazines is nonstop, unedited and unpretentious. A literary bounty of ‘eggcorns‘ beyond Shakespeare’s wildest imagination. That made me smile, and think, “That’s one way of describing it.” I could think of others. “Inane” comes to mind. I believe I’ll go have my first cup of coffee and see if I can surface some others. I first met Mrs. Malaprop in 8th grade literature. I wonder if today’s kids meet her at all? And here’s a random thought: I wonder if anyone yet has begun to study malapropistic emojis? 😊 Other than my occasional self-declared rants, I try to use neutral descriptions, although it is hard when discussing one of the numerous ways we are ‘going to hell in a hen basket’. The demise of our vibrant vocabulary, proper spelling and correct use of grammar is certainly one of my Top 5 Societal Pet Peeves. It’s also why I gravitate to blogs like yours! I’ll have to give emoji malaprops some thought and attention because I don’t remember seeing them used in that context. A good treasure hunt. Thanks, Linda, for adding to this fascinating topic. When I worked as a teacher, my impulse was to want to correct mistakes in what administrators said or wrote, but then I realized that it was better to let them betray themselves as the ignorant, education-hindering bureaucrats most of them were. I don’t really have strong opinions about that, as you can see. Tell us what you really think 😊. Thanks fir adding info on French derivation. There was an apology issued on NPR yesterday regarding Mrs. Malaprop. In a previous interview of some author, both the author and the NPR reporter claimed that “Quixotic” was the only example of a word in language steaming from a book. A literature professor called to point out that Malapropism was linked to Mrs Malaprop. He also gave many other examples. This has been a fun series Sammy, and I really like how you approached the challenge – good job!. I frequently misuse words or make up words, on purpose (my editor catches most of my unintentional misuse). I feel like I know more about this curious subject now. That reminds me of a billboard on our recent trip — a restaurant named Quijote’s. I pray this is someone’s actual name…and then I think about how we drive past the wind farm on the way, and it’s really all rather quixotic-ironic. Solely the words that Shakespeare invented are easily in the hundreds, silly Mrs. Malaprop. I would support your hope that that is someone’s name. The wind farms in the midwest are impressive. We have isolated blade sets here, but nothing like the ones I’ve seen driving through Iowa. Oh yes I LOVE those giant soaring ‘birds’ in Iowa! Been through enough times that my heart starts beating a little faster as we approach the set of hills where the first group is visible from the highway. I try for good shots out the car window! Quijotes is very clever and probably as hard for some to discern correct pronounciation as Quixote’. I can hear pronounciations like ‘kwit joats’ being turned into Quick Joe’s or Quit Joe’s. Fun stuff, our English from both England and U.S.
Dan, that must have been a fun interview in light of your interest in this series. Again, I appreciate your enthusiasm. I will be working on other language and writing topics – some whimsical, some serious – this fall and winter. If they seem worthy, i’ll share what I learn! Perhaps your editor could be persuaded to let a few more of your ‘made ups’ slip by the red pen for the sake of all us ‘descriptive lingual’ readers who appreciate a good eggcorn now ‘n then. As soon as I heard it, I thought of you and this series. I have a series of books on curious expressions, including: Hog on Ice (http://www.amazon.com/Hog-Ice-Other-Curious-Expressions/dp/0060513292) that my editor bought for me years ago. You are a ‘snucky’ devil getting that one past your editor! Thanks for the book plug. I will take a look. Ha ha – great way to end your comment, Jude! I was thinking the same! How many malapropisms come from mishearing the word. Broadcast media has homogenized both the culture and the language, it is an interesting idea that tweets and posts might reverse this effect. Jude’s comment was exactly what I was thinking …so many malapropisms are born from those who are learning the language and it certainly provides a great source of amusement. I have really enjoyed this series. Today I will be thinking about flutterbys 🙂 I like this word so much, I think we should start a movement to have it replace the incumbent. I agree, Joanne! Flutterby it should be! I’m so glad you enjoyed this series. It was a fun one to write even though I pretty much ignored the whole ‘photo’ theme of the challenge! Although no correlation between them, like flutterby for butterfly, my granddaughter used to call spaghetti ‘baskettie’ and she’d call bubble gum ‘guggle bum’. I love toddler language. So far you’ve compared yourself to Frasier and Niles. I’m waiting for Your Daphne or Roz to surface! Oh sorry! My memory must be failing me. Again! Thanks for an interesting piece of history, Sammy. I’m going to check out Mr. Rubin’s book ~ I love these malapropisms. 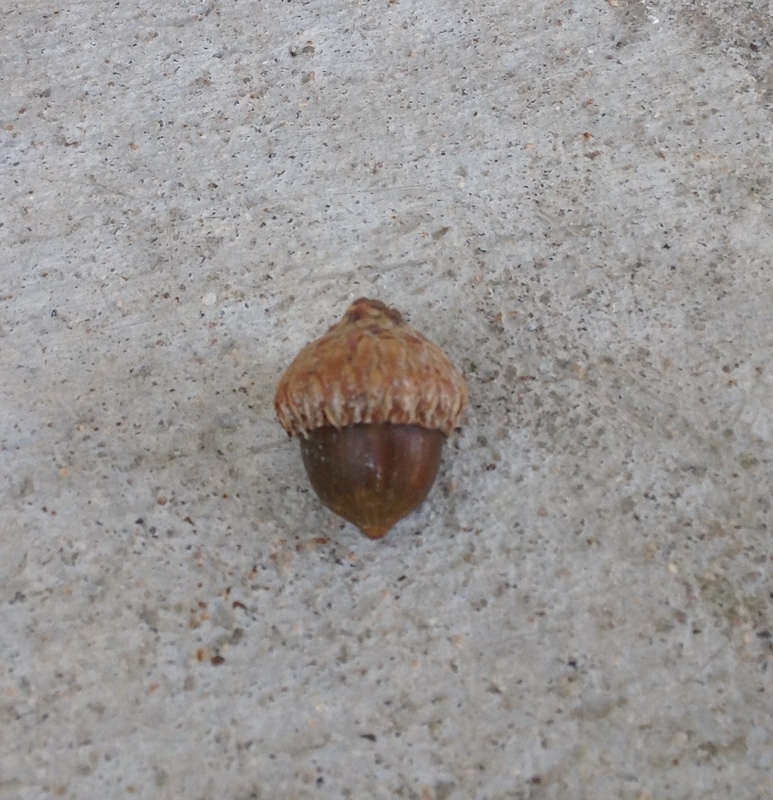 Fall is coming quickly here in Minnesota and our oak trees are showering eggcorns . . . er, acorns down on us like crazy. I wonder if squirrels get confused between eggs and nuts! Thanks for your humor, Carol. The French American loves learning new words. Eggcorn is a good one. Great post, Sammy. I love malapropisms! Hahaha. Great post. You’ve gotten me thinking. I hope you have a lovely rest of September, but don’t forget to COME BACK, y’hear? This is so awesome, Sammy!! I just read all five “malapropism” posts which were fun and entertaining (as always) but also educational. 🙂 I had no idea these word misuses were called “malapropisms” or who Mrs. Malaprop was. I think I might just have to get that “Going to Hell in a Hen Basket” book. I’ll admit to using “hone-in-on”, only unlike you I had no clue it was incorrect! This is fascinating, Sammy, I had to idea about the origins of malapropisms. I actually have Sheridan’s The Rivals, although I have yet to read it, but I’ve pulled it out and tossed onto my (enormous) to read pile for the next few months. I’m sure it will make for a very fun read. As a quick aside, at the risk of sounding old fashioned, I find the change in language, and more importantly in spelling, brought about by tweets, texting etc really frustrating .Like ‘u’ instead of ‘you’ and the likes. Huge pet peeve!! Me 2, Celine! Just kidding!!! Oh imagine what Shakespeare would say if he popped into our modern world. Perhaps he would run screaming from the stage! It would be interesting to hear what some of the early literary crowd would make of today’s culture and communication.